A Minnesota angler faces up to $3,000 in fines and one year in jail after allegedly catching nearly 250 fish over his legal limit. DNR conservation officer Shane Osborne of Evansville met up with Ronald Wayne Johnson, 69, of Carlos, as Johnson was about to pull his portable fish house off West Spitzer Lake in Otter Tail County. “I asked how the fishing was and he said he caught some fish, but it wasn’t that great,” Osborne said in a DNR news release. When asked if he had any fish at home, Johnson said he wasn’t sure. When Osborne and conservation officer Mitch Lawler of Alexandria visited Johnson’s home, they found 22 frozen half-gallon cardboard containers, six plastic bags and several loose fish and fish filets. 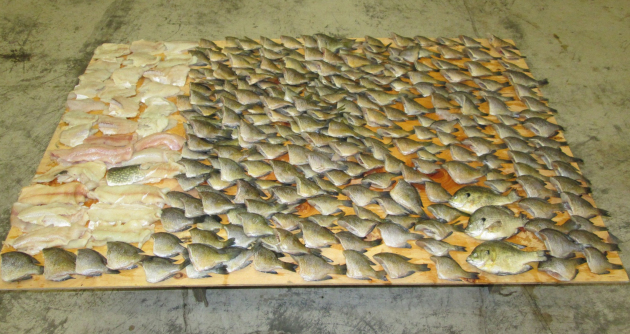 The cache totaled 228 sunfish, seven bass and six northern pike over the legal limit. The fish restitution value is $1,560. Because of an over-limit that took effect in March 2003, Johnson, if convicted, forfeits his fishing license for three years. He is scheduled to appear in Douglas County Court in February. The DNR says anyone witnessing a fishing or wildlife violation is encouraged to contact the nearest conservation officer, law enforcement agency or the toll-free Turn In Poacher (TIP) hotline at 800-652-9093. Also, #TIP is available to most cell phone users in Minnesota. Records show a Ronald Wayne Johnson, 69, formerly of Carlos, now has a Garfield, Minn., address. Both cities are in Douglas County. The phone at the latter address is out of service or has been disconnected, and efforts to reach Johnson for comment were unsuccessful.